Rita “Gammy” Finnerty Cumpson departed this life peacefully on February 12, 2019. Rita was the eighth of nine children born to John F. and Mary Saville Finnerty. Born in Cuyahoga Falls, Ohio on November 27, 1919, Rita was a 1938 graduate of Cuyahoga Falls High School. Immediately upon graduation, she went to work as a nurse’s aide at St. Thomas Hospital, helping to support her family during the Great Depression. With World War II underway, she proudly became a “Rosie the Riveter,” working at Black & Decker in Kent helping to produce airplane engines for the US Navy. On August 7, 1942, she married the love of her life, Mervin Cumpson, while he was on a three-day pass from his duties serving in the US Army. 1944 saw the birth of their beloved son, Garrett John Cumpson. In the decades that followed, Rita was a loving wife and mother as the family moved among Army postings in eight American and German states. Returning to Cuyahoga Falls after Merv’s retirement, Rita embraced being back among her large and loving family, and being reunited with her home parish, St. Joseph’s, the very church her father and other early parishoners helped build by hand in 1912. In 1992, Rita and Merv celebrated their golden wedding anniversary surrounded by family and friends, happily enjoying the big fête she had missed out on as a wartime bride. 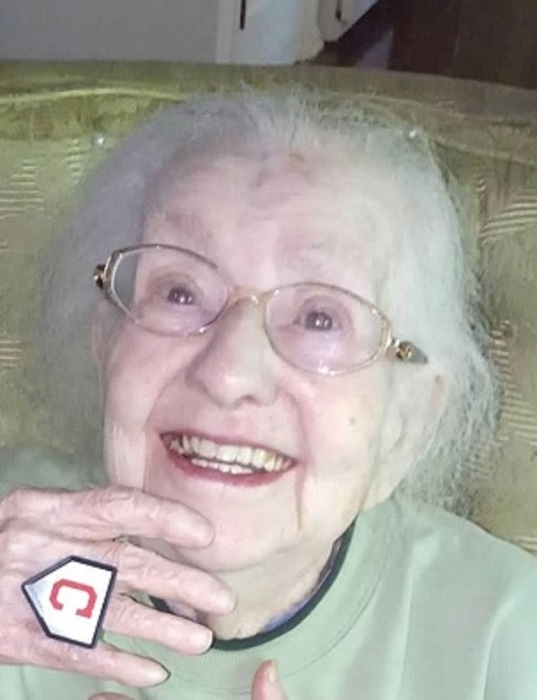 In those retirement years, Rita could be found playing the piano, unwaveringly rooting for her Cleveland Indians and spoiling her much-adored granddaughters, Natalie and Sarah. Rita was a devoted animal lover who doted on on her dogs and joyfully fed the wildlife in her backyard. Rita was preceded in death by her parents, siblings, and husband, and we know she is thrilled to be back with them now. Remaining to cherish the countless memories she leaves behind are son Garrett and his former wife, Poppy; granddaughters Natalie (Teresa Husted) and Sarah (Matt Cox); nieces Patty (Jim) Grow and Joan (Art) Robinson; grand-nephews Rob and Patrick (Lisa) Grow and grand-nieces Jennifer (Greg) Hobe and Emily (Todd) Badertscher; as well as innumerable other dear relatives and friends. A Catholic mass and celebration of Rita’s life will be held in March, with details to follow. In lieu of flowers, we ask that contributions be directed to the Cleveland Clinic’s Justin T. Rogers Hospice Care Center or the charity of your choice. Rita’s family is endlessly grateful to the exceptional care and comfort the hospice – staff and countless volunteers serving in various capacities – provided both to Rita and her loved ones during these brief but difficult final days.